Tomatoes come in two distinct growing types: Determinate and Indeterminate tomato plants. A third type, semi-determinate, is also available but I treat it the same as I would an indeterminate. Determinate tomato plants grow bush-like and usually no taller than about three feet. 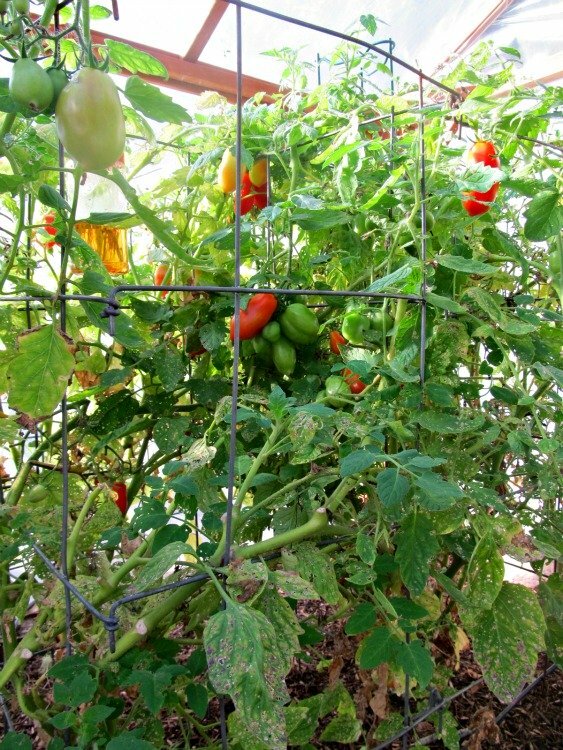 A tomato cage works well for these, and they require little pruning except for some leaf removal for air circulation. Determinate tomatoes will typically produce all of their fruit at once and then die. These tomato plants work well in patio containers. The advantage to determinate tomato plants is that they require less work and tend to have more resistance to disease. Determinate San Marzano plant supported by a 4-foot tall, square, steel cage. Indeterminate tomato plants grow tall and vine-like with lots of side shoots, although they do not have tendrils to grab onto supports. If left without support, this kind of tomato plant will sprawl all over the ground and be subject to disease and insects. Therefore, they require tall, strong supports and pruning to keep them healthy. 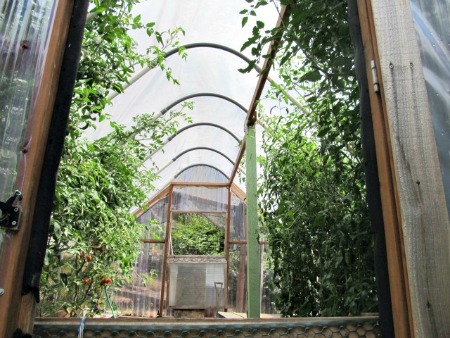 To grow them under cover, you will need a structure that allows the tomato plants to grow about 6-8 feet tall. The advantage to growing indeterminate tomato plants is that they continue to produce fruit until killed by frost. Keeping them under cover will keep them producing longer--we often continue to harvest from our indeterminate plants well into November in the Pacific NW. In October, the indeterminate tomato plants have grown to the ceiling of our large, plastic-covered house. They are a good 8 feet tall at this point. Indeterminate tomato plants can also be grown in large containers with tall support. Here's a photo of a semi-determinate plant called "Andes" growing on my deck in a 1/2 wine barrel planter on a spiral support. I created a teepee-shaped cover for this plant using, bamboo, twine and staples. Before selecting tomato seeds or plants to grow, it can be helpful to figure out ahead of time whether determinate or indeterminate tomato plants will be best for your sauce plan and your garden space. Seed catalogues, online seed sites and seed packages should have "Determinate" or "Indeterminate" listed for each tomato type. When purchasing plants, check the plant tag for this information. If you bring home a plant that you think is determinate but is growing like it's indeterminate--you could have an indeterminate plant by accident, but it's also possible that you have too much nitrogen in your soil producing an abundance of plant material and that makes your plant act indeterminate. Either way, you'll probably need to provide a taller support and do some pruning. Return from Determinate and Indeterminate Tomato Plants to Grow Tomato Sauce homepage.